Chihuahua, Mexico is a state that heavily relies on the cattle industry, accounting for over 70% of the economy. The cattle industry dominates in this region because of its' semi-arid climate that is mostly covered by pastureland for grazing cattle. Since the late 80"s, Chihuahua has been experiencing prolonged and on-going droughts that has severly affected the cattle industry. Thus, cattle farmers are losing their jobs as farmers. Chihuahua, boarders the United States and shares the Rio Grande with farmers in the US. Because of its close proximity to the United States, Chihuahua is home to one of the most powerful drug cartles. The Juarez Drug Cartel is based out of Ciudad Juarez and has a strong presence in the drug trafficking industry into the United States. This research argues that based on gang model research on membership and recruitment, cattle farmers and their families, vulnerable because they have lost their identity and their income due to drought, have a strong likelihood that they will join the Juarez Drug Cartel to regain a sense of identity and income. By joining, the Juarez Drug Cartel will grow in numbers and expand their territorial boundaries thus creating a more violent atmosphere. As global climate change continues to intensify around the world, the northern Mexican state Chihuahua, is feeling the damaging affects of climate change through prolonged drought. Chihuahua, the largest state located in the northwest region of Mexico and borders the southwest of the United States, is considered an arid to semiarid climate with seasonal rainfall happening mostly between August through September. Chihuahua is a livestock state, dependent on pasturelands for beef cattle grazing. Because of its desert-like environment, Chihuahua has experienced many prolonged droughts in the past and is continuing to suffer from them today. Another economic and violent component of the economy in Chihuahua is drug trafficking and drug cartels. Drug cartels in Chihuahua have a strong presence and power. (USAID, 2006). Not only does their presence already establish a violent environment, but also the drug cartels are also dependent on rich agricultural land in order to grow marijuana, their main crop of trade into the United States. When rainfall is seldom, like it is currently, both cattle farmers and marijuana growers are dependent on water distribution from the Rio Grande River, which boarders the US, and local well water from tapped in aquifers. However, because of the prolonged drought currently overtaking Chihuahua, water is scarce as aquifers are overdrawn and water from the Rio Grande is non-existent. From the map, and as mentioned previously, Chihuahua is a northern state in Mexico that borders the United States and the Rio Grande. 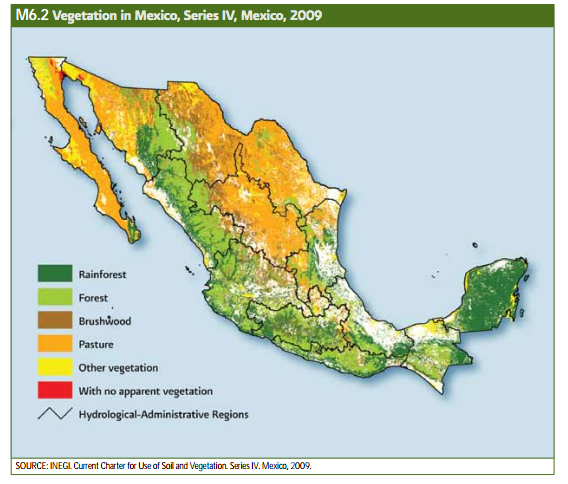 Image Source: Society for Range Management (Ortega-Ochoa et al, 2008). In 2002, approximately 22.7 million people or 22.3% of the population in Mexico participates in the agriculture sector of the Mexican economy. 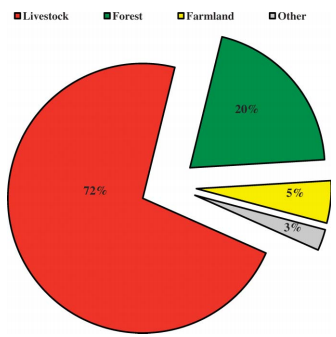 Moreover, agriculture accounts for 4.3% of the national GDP and of that, 53.9% is from livestock production units. (FAO, 2005).Because of Chihuahua’s semi-arid environment, the beef cattle production dominates in this area because of its large pasturelands for grazing cattle. Land tenure and agricultural land is distinguished as either private or in the social sector. The social sector is through the ejido system, which was implemented in the 30’s by President Lazaro Cardenas in an attempt to redistribute the wealth disparity in Mexico. Ejidos are portions of land given by the government to landless peasants for agriculture as an opportunity for food and income. Even though the ejido system no longer exists today in that ejidos are no longer provided, individual ejidos still exist and account for small cattle farmers in Chihuahua. (Peyton, 2009). The cattle farmers still farming on ejidos are usually small productions with less than 20 cattle per ejido, they are also family-based and rely mostly on unpaid labor within the family. Even though each ejido cattle farm is small in terms of the amount of cattle per ejido, they account for over 70% of the total cattle production in Mexico. Contrastingly, the private cattle production unit, usually have much larger farms between 20 and 100 cattle, account for only 30% of the total cattle production in Mexico. The ejido cattle farmers, relying mostly on unpaid family labor, is said to reduce their production costs because of free labor, still face many disadvantages and risks in comparison to the private sector. They often lack access to the market, and don’t have the infrastructure or equipment to provide high productivity rates. Moreover, they don’t receive any technical assistance and are at a greater risk of collapsing when faced with crisis. (FAO, 2005). Cattle farmers in Chihuahua use a grazing system for their cattle production units. This means that the cattle are outside confined to one area and eat the shrubs and grass in that confined pastureland. Once that particular area is depleted, both because the cattle consumed the shrubs and grass, but also because the cattle are standing in that one area for a long period of time, they are moved by the farmer to a new confined area, and the cycle repeats itself. Because of this grazing method, the cattle farmers are dependent on rainfall to keep their pasturelands lush for cattle feeding. If rainfall is scarce, the farmers will tap into their wells that are fed by the Rio Grande and local aquifers. Mexico is a country that has been taken over by drug related violence for the past decade. Drug cartels and gangs are a standard of life and they employ an estimated 450,000 people with operations all over Central and South America as well as the United States. Their conglomerate operations earn between $25 and $30 billion each year. (Morris, 2012). While the drug cartels are violent in their nature, approximately 3.2 million people are involved either directly or indirectly and depend on their presence and funds. Because there is so much money in this illicit business, drug lords will often invest their money into schools, medical clinics, and homes. (Beith). Moreover, Mexico is still considered a developing country with scarce employment opportunities. Thus, not only does the economy of drug cartels help communities, they also provide employment. This suggests that many of the northern states in Mexico where most of the drug cartels are based, like Chihuahua, depends upon and encourages these drug cartels simply for a boosting economy and job opportunities. In a way, it is seemingly organized and structured chaos. The ways in which these drug cartels operate are extremely violent and monarchical with few drug lords on top and many on the bottom. The economy functions because of the drug cartels, yet the people living in these places are constantly in a state of danger. (Morris, 2012). The drug cartels have created a structured political and economic system that is exacerbated through fear. Bowden summarizes, “In over a half century of fighting drugs, Mexico has never created a police unit that did not join the traffickers. Or die.” This confirms the notion of structured chaos, drug cartels create a structured system, and if broken, violence ensues. With this, it makes the Mexican state difficult to combat these issues that are inherent in the societal fabric. The dominant cartel in Chihuahua is known as the Juarez Drug Cartel and is based out of Ciudad Juarez, on the border of Texas near El Paso. The leader of the cartel, Jose Antonio Acosta-Hernandez also known as “Diego,” has been under caught and under the US law enforcement since March of 2012. According to the US Department of Justice, Acosta-Hernandez pleaded guilty for narcotics trafficking and money laundering, as well as s even counts of murder and weapons charges. (US Department of Justice, 2012). Drug Enforcement Agency Administrator Leonhart described Acosta-Hernandez as “a cold blooded murderer with no respect for human life or the rule of law.” Along with his leadership role in the Juarez Drug Cartel, Acosta-Hernandez is also a member of the Barrio Azteca, a violent street and prison gang that has grown into a transnational criminal organization. With this alliance, Acosta-Hernandez was able to ultimately control all of Chihuahua through violence from the gang, and drug trafficking through the cartel. Even though he was sentenced to seven consecutive life sentences in a prison in El Paso, Texas, both the Barrio Azteca and Juarez Drug Cartel continue to reign. According to Bowden, between 30 and 60 percent of the economy in Juarez is invested in money laundering for drug traffickers. (US Department of Justice, 2012). The election in November of 2012 showed victory for Enrique Peña Nieto, a member of the Institutional Revolutionary Party (PRI). PRI was in power for 71 consecutive years until 2000, when voters were fed up with PRI’s corruption. However Peña Nieto has brought PRI back into power. (Agren, 2012). The drug cartel’s success is often discussed as and given credit to the corruption of the PRI. For 71 years President’s and local government officials protected drug cartels through impunity and bribes. The level of impunity and corruption in the Mexican government in combination with the power of the drug cartels correlates with imbedded poverty. Mexicans have lost their faith in their government and therefore, rely on the cartels simply for a chance of livelihood. Julio Scherer Ibarra, defines impunity as “a circumstance in which the law does not apply to the powerful but only to the weak.” Impunity in Mexico is in favor of the powerful, and in this case, the powerful are the drug cartels. Despite PRI’s notorious linkage to drug cartels, upon election Peña Nieto has protested otherwise. In an op-ed for the New York Times, he announced, “I want to address the issue of organized crime and drug trafficking head-on. There can be neither negotiation nor a truce with criminals. With over 60,000 deaths in the past six years, considerable criticism from human rights groups and debatable progress in stemming the flow of drugs, current policies must be re-examined.” (Peña Nieto, 2012). He claims he will combat this problem by creating a 40,000 member paramilitary police that will focus on rural areas. (Villarreal, 2012). Despite these hopeful promises, there are concerns in the US with Peña Nieto going back to PRI’s infamous ways of favoring the drug cartels. Michael McCaul, a member of the Homeland Security Subcommittee on Border and Maritime Security denoted that, “While [Peña Nieto] has stated publicly he is committed to the security of his country against the drug cartels, I am hopeful that he will not return to the PRI party of the past which was corrupt and had a history of turning a blind eye to the drug cartels.” (Carroll, 2012). The Mexican government and their ability to govern is key in preventing conflict in Chihuahua’s current situation, facing drought in an environment run by drug cartels. Chihuahua with its semiarid climate and seasonal rainfall happening mostly between August and September has experienced many prolonged droughts in the past and is continuing to suffer from them today. Because of the state’s close proximity to the United States, both southern farmers in Texas as well as farmers in Chihuahua, use the Rio Grande that separates the two countries, as it’s main water source for agricultural production. Overuse from the US along with prolonged and frequent droughts in Chihuahua, the Rio Grande is slowly diminishing, causing for international disputes and civil unrest. The Rio Grade, runs over 180,000 square miles and spans across Colorado, Arizona and Texas then runs through Mexico and out into the G ulf. However, due to reduced rainfall and overuse, in 2001, a sandbar emerged and prevented the Rio Grande from reaching the Gulf. (Conner, 2005). With increased population on border cities of El Paso and Ciudad Juarez comes an increase of agricultural demands and water. In order to address these demands and avoid conflict, the US and Mexico have made numerous treaties, the most notable being the 1906 Convention between the United States and Mexico, equitable distribution of the Waters of the Rio Grande and the 1944 Utilization of Waters of the Colorado and Tijuana Rivers and of the Rio Grande. The 1906 treaty laid out an agreement that the US will deliver 60,000 acre feet of water annually in the Rio Grande for Mexico to use free of charge. With this delivery and agreement, the US therefore has all claims to the Rio Grande. It also says that in the case of extreme drought in the US, the delivery will be reduced. (Convention between The United States and Mexico Equitable Distribution of the Waters of the Rio Grande). The 1944 treaty, which is governed by the International Water and Boundary Commission (IBWC), lays out similar agreements of delivery but with more detail to specific areas, it also affirms that if Mexico is unsuccessful in providing 350,000 acre feet during times of extreme drought within a five year period. (Utilization of Waters of the Colorado and Tijuana Rivers and of the Rio Grande: Treaty between the United States of America and Mexico). This treaty was working well until a drought in 1993, which meant Mexico was unable to repay its water debt to the US and put Mexico into a hole of water deficit of 1.024 million acre-feet. (Marin, 2003). 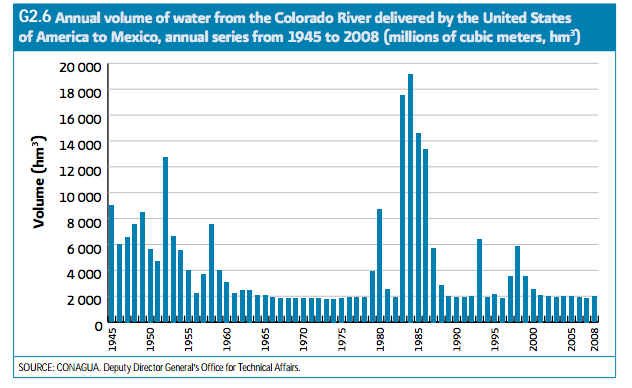 By 1995, Mexico was so water-depleted that the government declared the five most northern states, in a state of emergency and asked for an additional water loan from the Rio Grande. (Viña,2012). The deficit has continued to increase through today, as Mexico owes the US over 730,000 acre-feet of water. Infuriated American farmers have blamed Mexico for this problem by saying that Mexico has invested in more crops, which are more profitable to them, yet, more water intensive. This tension has resulted in many lawsuits between Mexican and Texan farmers. According to the Society for Range Management, drought can be defined in four ways, "1) low recorded participation amounts, 2) reduction in agricultura production due to low soil water conditions, 3) reduction in surface and underground water storage, and/or 4) reduction in society's well-being due to water shortages.) This report also denotes that Chihuahua's droug ht falls under each of these four categories of drought. 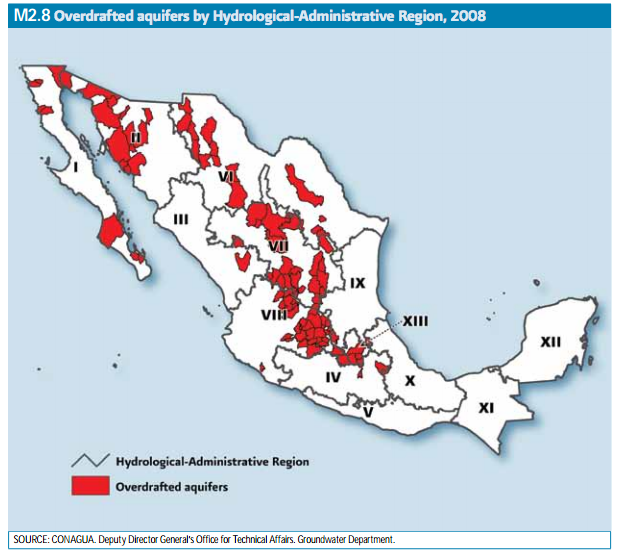 (Ortega-Ochoa et al, 2008) Furthermore, the National Water Commission of Mexico (CONAGUA), produces a yearly report on water statistics in Mexico, the most recent being 2010. In this, they provided details on percipitation rates, water stress, and drought conditions. The ecological region that Chihuahua resides is considered to have high water stress between 40 and 100%. Thus, this water stress has created the conditions for the ongoing drought. 7. Type of Habitat: Semiarid climate that is mostly covered by pastureland. As you can see from the map, Chihuahua in the north has a desert-like environment and their vegetation is pastureland which is why the cattle industry dominates in that region. Violence occurs mostly in the cities, like Ciudad Juarez near the border and are drug related organized crime. 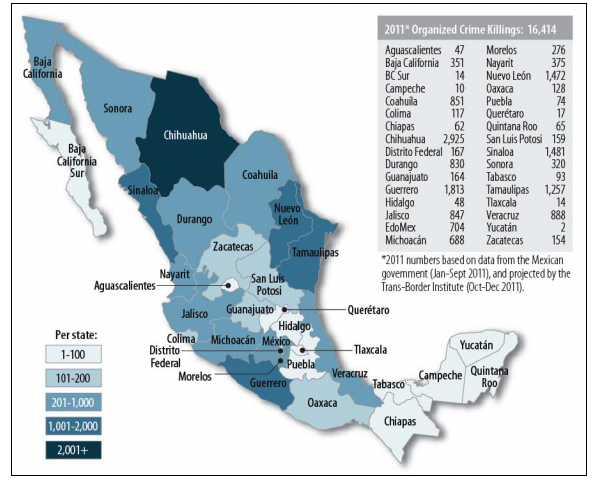 This map shows the level of organized crime in Mexico, Chihuahua in the north is dark blue noting over 2,000 killings for 2011. The presence of gangs and drug cartels in Chihuahua play a role in the level of violence in that state. As previously mentioned, the dominant cartel in Chihuahua is the Juarez drug cartel along with the partnership with the Barrio Azteca street and prison gang. In order to analyze the potential for violent conflict in relation to drought in Chihuahua, it is important to note the nature of gang and cartel membership and how gangs and cartels, particularly in Latin America, recruit members and maintain power. The United States Agency for International Development (USAID) released a report entitled USAID Central America and Mexico Gang Assessment that outlined gang-specific problems and created models of gang and cartel relations. 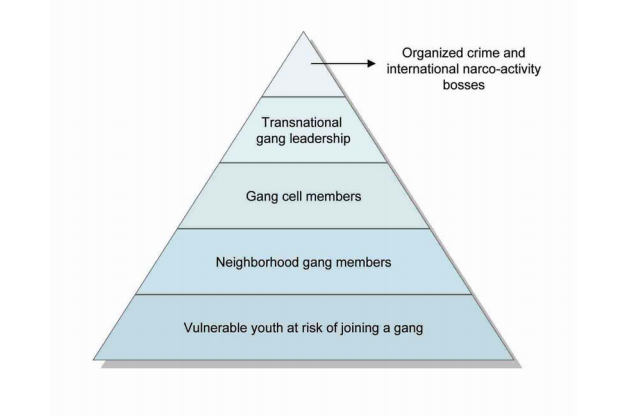 For example, the figure shown, (Image Source USAID, 2006) displays a general structure of the gang hierarchy. Every gang is different, so this cannot be applied completely but it is still important to consider. The report goes into detail breaking down each section, in summary, the top portion of organized crime and international narco-activity or the “bosses” are the leadership, in the case of Chihuahua it was Acosta-Hernandez of the Juarez Drug Cartel. These top-level gang members usually do not have direct communication with gang members on the street, they simply run their businesses from the comforts of their homes. The second section, transnational gang leadership, are region –specific leaders that have control over a certain area or neighborhood. 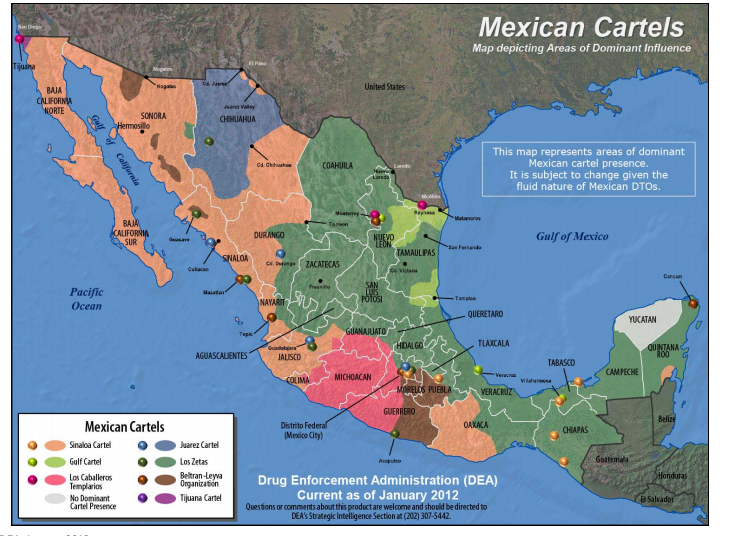 For drug cartels this would mean that they control the entire drug trafficking in this area and make sure that no other gang or drug cartel has a presence in their territory. The third section, gang cell members, is also region-specific and deals mostly with bribes and holding their presence and maintaining their power within that region. This includes paying-off policemen and also taking payments from local business so that the gang will “protect” them. The fourth section, neighborhood gang members, does the actual fighting when it comes to turf wars. If an outside gang is threatening a gang, the neighborhood gang members will do the shooting and carry the weapons. Finally, the bottom and largest portion is the vulnerable youth at risk of joining a gang. For Chihuahua however, this portion would be cattle farmers and their families who are vulnerable after losing their livelihoods. This is the most important section of the model to note for this case study. The report claims that this section. The report estimated that in Northern Mexico alone, there are approximately 17,000 people in gangs and cartels. Mexico, with its intrinsic ties to drug and gang violence currently has no anti-gang law, unlike other Central American countries and there is currently no law enforcement emphasis. Water, unlike other scarce, consumable resources, is used to fuel all facets of society, from biology and economy to aesthetics and spiritual practice. Water is an integral part of ecosystems, interwoven with the soil, air, flora, and fauna. Since water flows, use of a river or aquifer in one place will affect (and be affected by) its use in another, possibly distant, place. Within watersheds, everything is connected: surface water and groundwater, quality and quantity. Water fluctuates wildly in space and time, further complicating its management, which is usually fragmented and subject to vague, arcane, or contradictory legal principles. (Postel, 2005). In the case of Chihuahua, complicated management systems and drought are resulting in quantity loss, which is playing a role in societal norms and has the potential to lead to violent conflict. The Water Conflict and Cooperation report on the state of the World in 2005 claims that water disputes happen for three main reasons, quantity, quality, and timing. For Chihuahua’s water dispute, quantity and allocation of what’s left is causing tension. The report denotes, “Competing claims for a limited quantity of water are the most obvious reason for water related conflict. The potential for tensions over allocation increases when the resource is scarce.” (Wolf et al, 2005) The geographic spatiality of this water dispute is both national and local. National water conflict is defined as “Disputes can arise between subnational political units, including provinces, ethnic or religious groups or economic sectors.” Moreover, local water conflict is defined as, “Loss of water-based livelihoods (due to loss of irrigation water or freshwater ecosystems) can lead to politically destabilizing migrations to cities or neighboring countries.” (Wolf et al, 2005). The report claims that there is a higher potential for violence at the national level than at the international level. Chihuahua being a cattle state has lost an estimated 350,000 cattle only in the last 12 months due to current drought. Farmers, relying on income from those cattle, are scraping money to find water are in a cyclical downward spiral of no money and no way to make the money with their loss of income. Because of the lack of rain, cattle farmers are reyling on the 61 aquifers by digging deeper and deeper into their wells, which could run out any day. Some farmers however, can't even afford to dif deeper into their wells due to the extreme cost. This has not only affected farmers, but has created hunger and starvation for Chihuahua's residents. Many of the farmers, farm themselves to feed their families or to sell their crops at the local market, with no water, there are no crops, and hunger has ensued. Apart from drought, years of deforestation, land grabs for cattle grazing and contamination of water supply have all played a role in the degradation of the environment. As a result, many farmers have started to build illegal wells to avoid the rising costs of extracting water from government run wells. If local law-enforcement officals witness this, they are often ordered to shoot. (Tegel, 2012). While violent conflict is present in Chihuahua because of the Narco-Drug Wars, there currently isn't any research noting violence due to drought. However, as mentioned previously, in this case, Chihuahua cattle farmers are losing their sense of identity and livelihoods. In an environment that is already grounded upon drug cartels and gangs, the cattle farmers and their families are vulnerable, similar to the at-risk vulnerable youth in the USAID gang model. Because the drought is collapsing the cattle industry because of loss of pasture lands, the cattle farmers can no longer be cattle farmers. Thus, vulnerable andat a loss of money and identity, make a strong case for joining the drug cartels for a sense of being and economic benefits. For Chihuahua, cattle farmers would be joining the Juarez Drug Cartel. The conflict in Chihuahua is both civilan and military related. It is civilian because cattle farmers have tension with other cattle farmers over water disputes. Moreover, the Juarez Drug Cartel has a specific territory and when the territory is threatened, there is violence. In the same sense, drug cartels have power in their regions and are responsible for maintaining that power through bribes to government officials and the military. Thus, the military, while not directly violent, ensures saftey and protection to allow drug cartels to carry out their orders through impunity. 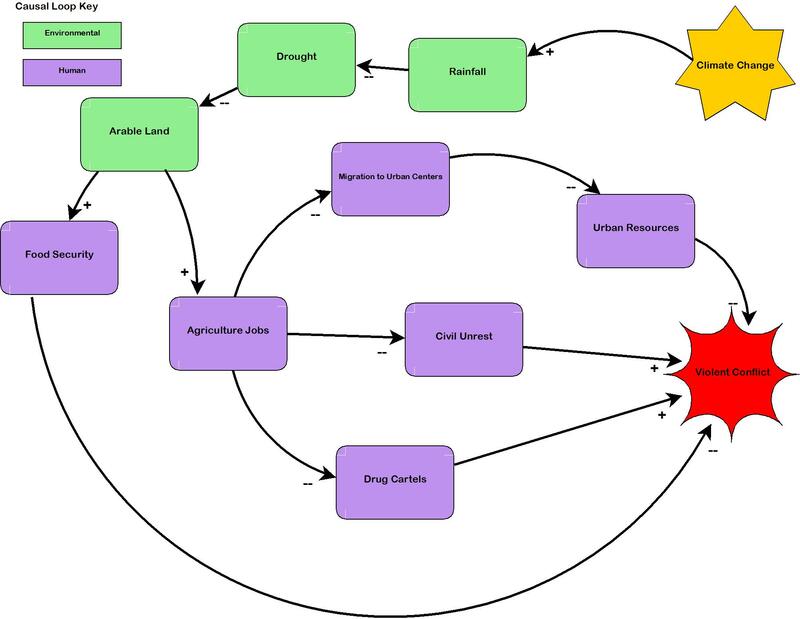 This diagram displays the environment-conflict link. To explain further, climate change is causing drought in a Mexican state that is highly dependent upon arable land for livestock grazing. The cattle industry accounts for over 70% of the overall industry which means a large portion of the Chihuahuan population is in the cattle industry. However because of climate change and an on-going drought, there is a loss of agricultural jobs related to the cattle industry. With this not only comes a loss of identity, but many of the cattle farmers are left with no work and no income while trying to feed themselves and their families. As discussed previously, gang membership and recruit takes place mostly for vulnerable at-risk youth populations. However this data shows support that the loss of identity of cattle farmers along with the need for money to survive makes them vulnerable and at-risk to join the Juarez Drug Cartel. The drug trafficking industry dominates in Chihuahua so recruitment into the cartel would provide cattle farmers and their families with an outlet to provide income, a sense of identity and belonging and overall wellbeing. Thus, with an increase in cartel participation, there is an increase in violence. This dispute is on-going, the Mexican government has made numerous promises to combat drug-related violence however previous administrations have failed in this, showing their corruption, impunity and alingment with the drug cartels. The situation has potential to worsen as a result of the on-going drought in Chihuahua as the drug cartels recruit vulnerable farmers and their families to strengthen their ties and expand their boundaries. Agren, David. "PRI Returns to Power in Mexican Election." USA Today. USAToday.com, 7 Feb. 2012. Web. Beith, Malcolm. The Last Narco: Inside the Hunt for El Chapo, the World's Most Wanted Drug Lord. New York: Grove, 2010. Print. Carroll, Rory. "US Concerned Mexico's New President May Go Easy on Drug Cartels." The Guardian. N.p., 1 July 2012. Web. Conner, Mary. "Beyond Water Wars: The U.S.-Mexico Conflict Over the Rio Grande and the Road to the ICJ." State Bar of Texas Environmental Law Journal 35 (n.d.): n. pag. 2005. Web. Estados Unidos De Mexico. National Water Commission of Mexico. Office for Planning. 2030 Water Agenda. Comp. CONAGUA. CONAGUA, Mar. 2011. Web. <http://www.conagua.gob.mx/english07/publications/2030_water_agenda.pdf>. Estados Unidos De Mexico. National Water Commission of Mexico. Office for Planning. 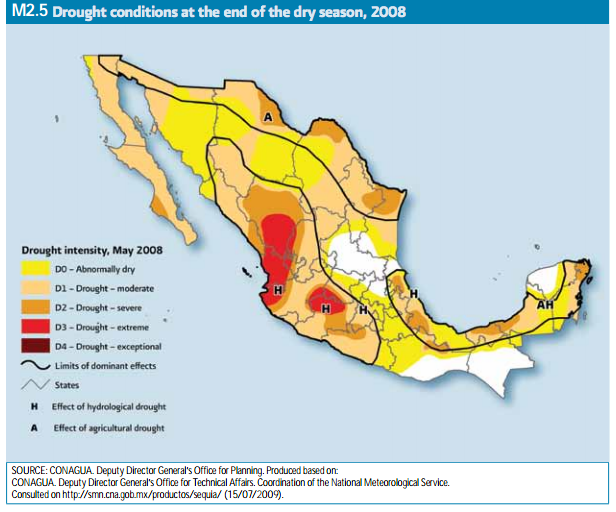 Statistics on Water in Mexico, 2010 Edition. Comp. CONAGUA. CONAGUA, 2010. Web. <http://www.conagua.gob.mx/english07/publications/EAM2010Ingles_Baja.pdf>. Food and Agriculture Organization. Mexico Livestock Sector Brief. Rep. Food and Agriculture Organization of the United Nations, Mar. 2005. Web. Marin, Carlos. "Bi-National Border Water Supply Issues from the Perspective of the IBWC." United States-Mexico Law Journal 35 (2003): n. pag. Heinonline. 2003. Web. Morris, Stephen D. "Drugs, Violence, and Life in Mexico." Latin American Research Review 47.2 (2012): n. pag. University of Pittsburgh, 2012. Web. Ortega-Ochoa, Carlos, Carlos Villalobos, Javier Martinez-Nevarez, Carlton M. Britton, and Ronald E. Sosebee. "Chihuahua's Cattle Industry and a Decade of Drought: Economical and Ecological Implications." BioOne(2008): n. pag. Bioone.org. Society for Range Management, 2008. Web. <http://www.bioone.org/doi/pdf/10.2111/1551-501X-30.6.2>. Peña Nieto, Enrique. "Mexico's Next Chapter." New York Times 2 July 2012, Opinion Pages sec. : n. pag. Nytimes.com. 2 July 2012. Web. Peyton, Dennis John. Ejido Property. Comp. Law Mexico Publishing. 2009. Article. Tegel, Simon. "Chihuahua: Where the Rain Doesn't Fall Any More." The Independent. N.p., 11 July 2012. Web. United States Agency for International Development, comp. 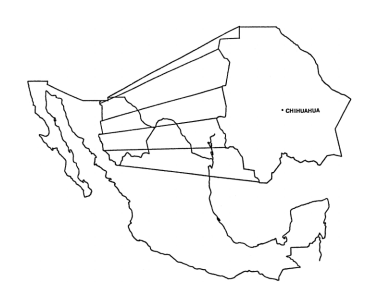 Central America and Mexico Gang Assessment. Issue brief. United States Agency for International Development, Apr. 2006. Web. United States. Cong. Congressional Research Service. The United States--Mexico Dispute Over the Waters of the Lower Rio Grande River. By Stephen R. Viña. Cong. Rept. Library of Congress, 21 Mar. 2005. Web. United States. Cong. Senate. Department of State. Utilization of Waters of the Colorado and Tijuana Rivers and of The Rio Grande: Treaty between the United States of America and Mexico. S. Doc. Washington DC: n.p., 1944. Print. United States. Cong. Senate. US Senate. Convention Between the United States and Mexico: Equitable Distribution of the Waters of the Rio Grande. S. Doc. N.p. : n.p., 1906. Print. United States of America. Congressional Research Service. Mexico's Drug Trafficking Organizations: Source and Scope of the Violence. By June S. Beittel. N.p., 15 Apr. 2013. Web. <http://www.fas.org/sgp/crs/row/R41576.pdf>. United States of America. Department of Justice. Juarez Drug Cartel Leader Pleads Guilty to Charges Related to US Consulate Murders and Is Sentenced to Life in Prison. Department of Justice, 5 Apr. 2012. Web. Villarreal, Ryan. "Mexico's Drug War: A New President Outlines a New Strategy Likely to Produce Old Results." International Business Times. Ibtimes.com, 21 July 2012. Web. Wolf, Aaron T., Annika Kramer, Alexander Carius, and Geoffrey D. Dabelko. "Managing Water Conflict and Cooperation." Comp. WorldWatch Institute. State of the World: Redefining Global Security (2005): n. pag. 2005. Web.